Following her initial diagnosis and treatment for ovarian cancer, Houda had two recurrences and four surgeries over the course of three years. Her story enables her to form long-lasting, meaningful relationships with the women she meets while volunteering. 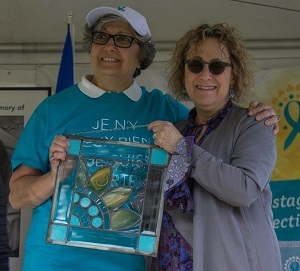 Nurses at the hospital and women whose lives Houda touched nominated her for the Peggy Truscott Award of Hope, which celebrates and acknowledges the dedication of an individual or group who volunteers to support the mission of Ovarian Cancer Canada. “Regardless of whether or not I was going to win the Peggy Truscott Award, I was really touched to even be nominated. It told me I am making a difference and people are seeing this,” says Houda. But it’s not the recognition that motivates her - it’s the community. 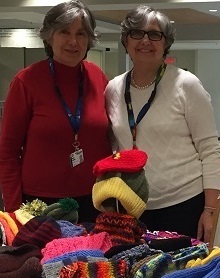 Since receiving the 2017 Peggy Truscott Award of Hope, Houda continues to invest time supporting other women and knitting to raise funds, increasing awareness of ovarian cancer at every opportunity. She is also inviting the people she meets to register for the Ovarian Cancer Canada Walk of Hope, which brings together women and families who have been affected by this disease. Houda is looking forward to walking in Montreal. Most recently, Houda volunteered to help moderate discussions on OVdialogue, the online community where women with ovarian cancer can get to know one another and exchange information based on their firsthand experiences. “I am able to support women who are not close to me, physically. I can still help them, even if I can’t see them,” she explains. To make a difference for women and families living with ovarian cancer, join Houda at the Walk.